Go ahead, Relax in it! This is the kilt in which you can completely unwind. Put it on and hang out, wear it after work, or after the gym. Super comfy with an easy velcro waist attachment. I paid up for the pockets and it was totally worth it. Enjoy me kilt as it is so easy to wear, comfortable, good quality, fairly priced. This was a gift for my husband as part of his anniversary present. He had already had one comfy kilt and worn it through. I was very excited to be able to get the Black Watch tartan this time. He marched with a color guard and they wear the same tartan. Now, even at rest he can practice marching. He loves it!! Just what he (meaning I!) wanted! 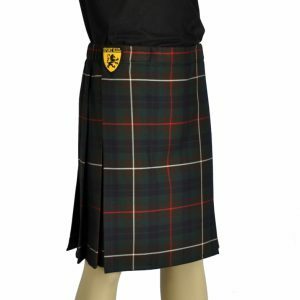 I ordered the Black Watch Comfy Kilt for my husband for Christmas. When he opened it, he started laughing, knowing that I was up to something! He seemed happy and said “anything for you,” when I asked if he was going to wear it. Now he has worn it a few times here at home while relaxing, watching football. He finds it very comfortable and reaches for it now instead of his pjs. I’m so happy I went ahead and ordered his Comfy Kilt!! I received the kilt and it fits very well. I haven’t had an occasion to wear it other than around the house, which is often. LOVE IT! Most Comfortable for Hanging Around the House. I bought my original kilt from SportsKilt several years ago, and because I have lost a lot of weight went back to look into ordering a new one, when I discovered the “Comfy Kilt.” I love it. I wear it pretty much every day. I throw it own after my morning shower with a tee shirt to let the dog out, make coffee and breakfast. In the evenings, if I know that I am not running out to a meeting, I put on the Comfy Kilt. The material is soft, like cotton flannel PJs. The waist holds very securely with the velcro. It does not hold crisp pleats, but I did not expect it to, and don’t care as I am not wearing it for fashion, but for comfort. Exactly as I expected. A flannel “kilt.” Nothing I would wear in public. Pleats: what pleats? Choice: what choice? Guys, it isn’t made for parades or formal occasions. The description about it should be enough. What it is, is a comfy, lightweight alternative to wrapping about you a towel. The ENTIRE reason for calling it the “comfy kilt.” I wear it mostly inside but occasionally outside for yard work. I live in Houston, Texas. It gets horribly hot and humid here. You don’t want to see a middle aged (but, actually very good in-shape [ex-army]) old man in what is basically a cotton skirt, don’t look. Quit slowing down as you drive by, you perv! Seriously though, the thing is extremely comfortable and is quick, easy velcro vs straps and buckles. Only wrapping a towel about is quicker, but heavier. Bought the comfy kilt for my son in law for Christmas. He loves it. A successful present and I will be purchasing more from this excellent company. Exchange in size was easy and they were most accommodating. I have a blackwatch tartan for wearing out, and another sportkilt I love, but for wearing around the house and doing chores I love this kilt. The most comfortable piece of clothing I have. I highly recommend it. Just buy it, you won’t regret it. Just purchased and received my new sport kilt..am very pleased and amazed how comfortable it is..I am planning on making another purchase on another kilt soon. A very Satisfied Customer in Oklahoma. This is indeed the most compfotable kilt I have ever worn. Just wish it came in other tartens. The most comfortable thing I own! I got the comfy kilt for my birthday and I’ve been relaxing in it as much as possible since. This thing is sooo comfortable and perfect for the beautiful weather we have been having here in my area. I work as a firefighter/EMT and my supervisors allow me to show my heritage pride and lounge around the station wearing the kilt as long as I have my uniform pants close by in case me have an emergency. When a call comes in, putting them on are a snap. Just pull them up and remove the kilt and I am off to wheel and heal. I love my sport kilt. I use it after cycling and it makes changing in the parking lot very easy. No more dropping the towel wrapped around your waist. Extremely comfortable to wear around as well. I wear this around the house every day. It’s great to throw on after a shower, and it doesn’t hamper household chores. I should have gotten this years ago. I have only experience with this one product and it worked just fine for ST pat’s day. This kilt is awesome. The fabric is durable, easily pressed, and looks great. My wife had to pry it off of me after a week to wash it. You will never want to take the comfy kilt off unless it is to put on your sport kilt. I train in the comfy kilt as well as my sport kilt. This kilt can handle the stree of huge squats, dead lifts, and loading stones. It is great for lawn work, sitting around the house or a quick trip to the store. I saw this and thought “what the heck”. Very comfy to lounge around in around the house. The fabric does seem to have a mind of it’s own at times. Wonderful for it’s intended purpose! If you’re buying a kilt for the first time with just 1 event in mind (a dare, Halloween costume, high school event) this kilt is too informal, fabric is quite different. Splurge a bit & get one of the other Sportkilts, which look better because of the nicer pleats, nicer fabric, more color choices & options. You’ll be glad ya did. But for just relaxing, the comfy kilt wins. Very comfortable to wear, soft flannel fabric which does wrinkle – but who cares, it feels so good. Great for changing in public, packs easily in a gear bag. Only complaint: this is the only color. Looking forward to buying another when more colors become available. Very happy with my Comfy Kilt,looking forward to ordering the Works K.Enjoy wearing my kilt whenever possible,can t wait for warm weather.Thanks for the superior product,cant wait to wear it when the weather warms up,Thanks Grant. I have a fair portion of Scottish blood in my background and have been drawn towards kilts for a while. A couple of trips to Scotland, visits to Highland Games, the lone piper at funerals, cousins that are in fire fighter bands, these are just a few of the many times I have seen folks in kilts and just thought that there was something right about them. I have enjoyed your web site for several years. I tend not to be impulsive and can often research an interest to the point that I get my self â€œover itâ€ before I feel the need to make a monetary investment. The tipping point for me was some impending surgery. Every man has faults and weaknesses and one of mine is that I am one of the most squeamish human beings I know. Yes, I can bear the pain and day to day suffering that was associated with my condition but cringed at the idea of the procedure that supposedly would free me from this misery. I was very happy with my casual kilt purchase. I am fairly certain that it is the first of several. The kilt lives up to all the claims made. I like it, my wife likes it, and my surgery is now in the past, though Iâ€™d much rather think about kilts then medical procedures. Thanks for producing a special product, an item that is so much more than a bolt of cloth. This was bought as a gift for someone who was cautious about kilts, they are now a convert. The only downside is, as warned, a low resilience of the pleats, but that can be fixed with a quick ironing. I love it! I use it to change back into ‘civies’ after a bicycle ride but I have worn it around the house a few times and it is WAY comfortable. I would definitely buy another one. i absolutley love this kilt. purchased the works kilt at the same time about a year ago and couldn’t be happier with both. even purchased one for my father and he is hooked as well. only complaint…… i want another one in a different color. The only problem I have had with the Comfy Kilt so far is that it is in fact so comfortable I have to keep checking to make sure it is still in place. The cotton is heavy enough to feel durable, the velcro connections are formidable, the inner pocket is convenient (if a bit embarrassing), and I would recommend owning one in a heartbeat. We bought these for a cheap solution to the mens attire for our wedding. The pleats will not last long, so you might want to consider having them sewn in before wearing. All the guys loved them and they looked fantastic! They processed and shipped our order right away. I got the comfy kilt to use for changing in and out of my mountain bike kit. Using a towel just wasn’t working since most of them barely fit around my big arse. Lately I find myself wearing the kilt home instead of changing into “street clothes”. Next thing you know I will be sporting it at the taco shop. I have a 40 inch waste and the XL comfy kilt fits great. I just received my second Comfy Kilt. Why have two? I didn’t want to have to pack it everytime I traveled to my vacation home so I ordered a second one for there. I found that wearing the kilt around the house is very comfortable and cool. My better half Sally likes to see me wear it rather than shorts or long pants. When one has a Scotch one must be properly attired in a kilt and a Comfy Kilt fits the bill. I only bought for a one time event but it is something that I can see myself wearing as often as possible. Great for lounging around the house or doing yard work. I bought a kilt for my friends B-day and he absolutely loves it. Ordering was a breeze. I had one question called customer service they were awesome and very helpful. Regular ground shipping took 2 maybe 3 days to receive order. Thanks a bunch!!! I bought this as a birthday gift for my boyfriend, who already owns a couple of other more formal kilts. He wanted this one to wear when lounging around the house instead of his usual “comfy pants”. Well, he wore the new kilt for 3 days in a row before I managed to get it into the wash. Definitely exactly as comfy as described! Bought the kilt for my brother and he absolutely loved it! The order came very quickly. The materials is great. He can’t wait until he can start watching football games in his comfy kilt. Most often worn item I own! It’s light, breezy, and free fitting. It was worth every penny. I’ve got one and I recently bought one for my brother. You won’t regret getting this. Really. I really like the comfy kilt and am considering purchasing another. I like the freedom, the feeling, and the compliments I get because of it. I bought my first kilt, the works kilt, somewhat as a gimmick but liked it so much I had to have an everyday kilt. I can assure you, I’m now a customer for life. The comfy kilt is the right amount of comfort, the right amount of ease in caring for it. What you get is a no nonsense kilt that is perfect for lounging around in and running to the store to pick up beer and brats. The day the comfy kilt comes out in another color, I’ll be adding #2 to my wardrobe. Thanks so much for a great product and great customer care 100% of the time. If you like to lounge around the house, this is the kilt for you. When I’m at home I scarcely take mine off. On a comfort scale of 1-10, this kilt rates a 15. Love this kilt. It is so comfortable. This kilt is perfect for boating. It makes changing on the boat a snap. I throw it on over my pants, yank down the unwanted garments from under the kilt. I always intend to put on my trunks but I never put my swim trunks on until I’m about to go in the water. This kilt looks great and feels great too. I know Its recommended for lounging around the house, But I wear this one around all summer. My friend and family love it on me.